에모리 대학교(Emory University)는 미국 남부 조지아주 애틀란타에 위치한 명문 사립대학교이다. 2018년엔 매해 미국 전국 대학 순위를 발표하는 주간 잡지 U.S. News & World Report에서 미국 최상위권 명문대학교인 조지타운 대학교와 UC 버클리와 함께 공동 21위를 기록하였으며, 듀크 대학교, 밴더빌트 대학교, 라이스 대학교와 함께 남부의 하버드로 불리기도 한다. 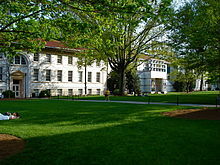 에모리 대학교의 학부는 정식문리대(Emory College of Arts and Science), 2년제 문리대 (Oxford College), 간호대 (Nell Hodgson Woodruff School of Nursing), 경영대 (Goizueta Business School)의 네개의 단과대학으로 구성되어 있다. 에모리 대학교에는 학부와 대학원에 모두 약 만명정도의 학생이 재학하고 있으며, 학부생중 약 18%가 외국 유학생이다. 학부 재학생 중 백인이 41%로 가장 많으며, 소수민족으로는 동양계가 18%로 가장 많다. 교수 학생 비율은 8:1로 훌륭한 교육 여건을 갖고 있으며, 자연과학분야인 생물학, 신경과학을 포함하여 경영학, 심리학 등 상경, 사회과학분야에서도 높은 평가를 받고있다. 에모리 대학원은 문리대학원, 의학대학원, 법학대학원, 경영대학원, 간호대학원, 신학대학원으로 구성되어있다. 일반대학원의 경우 전국 톱 20, 법학대학원과 의학대학원의 경우 전국 톱 25, 경영대학원은 톱 20, 간호대학원과 신학대학원은 톱 5 로 전문대학원 역시 최상위권으로 평가 받는다. 특히 이전부터 한국과 인연이 깊은 대학교로 평가받는다. 한국인 출신 동문으로는 정치인 윤치호, 국무총리 이홍구, 부총리 한완상 등이 있다. 학생수 약 11,300여명을 갖고 있는 에모리 대학교는 미국 명문 대학 중 하나로 꼽힌다. 듀크 대학교, 라이스 대학, 밴더빌트 대학 등과 함께 전국적인 명성을 얻고 있으며, 특히 법대, 경영대, 의대는 국제적으로 명성이 높다. 2006년 시사주간지 <뉴스위크>가 선정한 25개 명문대학 그룹인 ‘뉴 아이비(New Ivies)’에 포함되었다. 애틀랜타 시 동북쪽의 넓은 녹지대인 드루이드힐스에 위치하고 있으며 캠퍼스 면적은 2.6km2이다. 에모리 대학교는 1836년에 설립되었으며 조지아 감리교 연회의 존 에모리 감독(bishop)의 이름을 따서 지어졌다. 처음에는 3명의 교수와 15명의 학생으로 수업을 시작했다. 미국 남북전쟁 이후 재정부족으로 어려움을 겪다가 후원금을 통해 부채를 청산하고 건물을 확충했다. 1915년 코카콜라를 창설한 아서 캔들러로부터 기증받은 애틀랜타 지역의 부지로 캠퍼스를 이전했으며, 종합대학교로 승격되었다. 1919년 경영대학과 대학원을 신설했다. 1979년 코카콜라 회장을 역임한 로버트 우드러프로부터 거액의 기부금을 받은 뒤 크게 성장했다. 에모리 대학은 연합감리교회 계열의 대학이다. 예술, 과학, 신학, 비지니스, 법, 의학, 공중 보건, 간호 학부를 포함하는 9개 대학부로 구성한다. 에모리는 시사 주간지 U.S. 뉴스 & 월드 리포트에 따르면 전국 대학들 중 18위였으며 경영대학(Goizueta Business School)의 학부 비지니스 프로그램은 2008년 주간지 <비즈니스 위크>에 전국 5위로 실렸다. 에모리대학의 의학대학원(Emory University School of Medicine), 법학대학원(Emory Law School), 경영대학원(Goizueta Business School MBA program)은 모두 전국 21위에 포함되며 명성이 높다. 또한 에모리의 신학대학원(Candler School of Theology)은 United Methodist Church 소속으로 유명하다. 한국과의 인연은 19세기 때부터 시작됐으며, 1890년 조선말과 대한제국시대의 지식인이며 애국가의 작사가로 유명한 윤치호 선생이 에모리대에서 공부를 했었다. 그는 당시 매우 우수한 학생이어서 학교의 토론팀 멤버로도 활동할 정도였다. 에모리는 그러한 인연을 소중히 간직하고 당시의 윤치호 선생의 일기를 영문과 한글로 출판하기도 했다. 또한 그의 기독교 선교 활동과 실업교육 등의 공적을 기념하여 에모리 대학교는 1930년 윤치호에게 명예 박사학위를 수여한 바 있다. 100여 년 전에 시작된 인연은 그 뒤로도 계속돼 많은 한국 유학생들이 다녀갔으며 현재 한국에는 국무총리와 주미한국대사, 주영한국대사를 지낸 이홍구, 부총리와 장관을 지낸 한완상을 비롯, 정계, 학계, 종교계, 여성계 등에 많은 에모리 대학교 졸업생들이 활동하고 있다. 그 뒤 대한민국 김대중 15대 대통령도 이 학교에서 명예 박사 학위를 받은 바 있다. 1977년부터 1993년까지 총장을 역임했으며 에모리 일반대학원 (Laney Graduate School)이 이름을 딴 James T. Laney는 1950년대 한국에서 선교활동을 했으며 이후 한국에 대한 좋은 기억으로 연세대학교 신학대학에서 교수로 재직하기도 했다. 현재 연세대학교는 그의 공헌을 기념하여 레이니 석좌교수를 임명하고 있다. 제임스 레이니는 이후 주한미국대사로 부임하기도 했다. 에모리대 출신 인사로는 이홍구 전 총리(현 중앙일보 이사회 의장)가 있다. 1959년 에모리대 정치학과를 졸업했고, 1963년부터 69년까지 이 학교 조교수를 역임했다. 한완상 전 통일부총리 또한 에모리대학 동문이다. 한 전 부총리는 2009년 에모리대학의 "명예로운 해외 동창상" 수상자로 선정되기도 했다. 국내 에모리대 인맥은 의대 출신이 많다. 김학선·권상옥 연세대 의대 교수, 손수상 계명대 의대 교수가 에모리 출신. 김집 전 체육부 장관도 젊은 시절 에모리대에서 의학을 공부했다. 오수국 육사 교수(영문학)도 에모리대 동문이다. 경제계에선 임태섭 골드만삭스 한국대표, 김우택 쇼박스미디어플렉스 사장이 에모리대 MBA 출신이다. 사회계에선 고 김대중 대통령의 손자 김종대씨가 에모리에서 공부했다. 학계에서는 윤영섭 연세대 의대 교수, 이선이 아주대 사회학과 교수, 정연선 육사 영어과 교수, 조철원 서울대 영문과 교수, 함인희 이화여대 사회학과 교수 등이 활동 중이다. 감리교신학대 김외식 전 총장, 신학과 박종천 교수, 안석모 교수, 한일장신대 김정선 교수 등이 에모리 출신이다. 이 부분의 본문은 List of Emory University people입니다. Young John Allen (1858C), American Methodist Missionary in the late Qing Dynasty China, played an instrumental role in influencing missions that ultimately established Christianity in Korea. Isaac Stiles Hopkins (1859C), 1st President of the Georgia Institute of Technology. Warren Akin Candler (1875C), President of Emory University, Brother of Asa Griggs Candler, the founder of The Coca-Cola Company. 윤치호(Yun Chi-ho) (1893C), Author of Aegukga, the national anthem of the Republic of Korea. Thomas Milton Rivers (1909C), Director of the Rockefeller Institute, The "father of modern virology." Robert W. Woodruff (1910C), President of The Coca-Cola Company (1923-1954), Transformed Coca-Cola into the world's most recognizable brand. Dumas Malone (1910C), Pulitzer Prize for History, Presidential Medal of Freedom. Bobby Jones (1929JD), The only person to achieve Grand Slam, founder of the Masters Golf Tournament, and often considered as the greatest golfer of all time. Kiyoshi Tanimoto (1940C), Hibakusha portrayed in John Hersey's Hiroshima (book) and organizer of the Hiroshima Maidens reconstructive surgery program. Ernie Harwell (1940C), baseball broadcaster for the Detroit Tigers. Sam Nunn (1960C, 1962LLB), United States Senator from Georgia. Newt Gingrich (1965C), the 58th Speaker of the U.S. House of Representatives. James T. Laney, 17th President of Emory University, United States Ambassador to Korea from 1993 to 1997. Bernice Albertine King (1990JD), Civic Leader and American Minister, Youngest child of Martin Luther King, Jr. and Coretta Scott King. Christopher McCandless (1990C), Alaskan wilderness adventurer. Main subject of Jon Krakauer's Into the Wild. Tom Brokaw (2005H), Author of The Greatest Generation (1998), Peabody Award (1989) and Presidential Medal of Freedom (2014). Arnold Schwarzenegger (2010H), Austrian American Actor and Philanthropist. 38th Governor of California from 2003 until 2011. Salman Rushdie, Iconic novelist and University Distinguished Professor. William Foege Professor Emeritus, Rollins School of Public Health, American epidemiologist credited for the global eradication of Smallpox. ↑ bishop은 감리교에서는 감독, 성공회, 로마 가톨릭, 정교회에서는 주교라고 한다. ↑ “Young J. Allen”. 《google.com》. ↑ “Warren Akin Candler Sr.”. ↑ “A Direct Line to Emory's History”. ↑ “Charles Howard Candler Sr.”. ↑ “Alben Barkley, Emory University”. ↑ “Hong Koo Lee (1959C)”. ↑ “Kim Dae-jung, Emory University”. ↑ “보관 된 사본”. 2015년 3월 13일에 원본 문서에서 보존된 문서. 2015년 4월 2일에 확인함. ↑ 가 나 “Emory University Professors”. ↑ Paulson T (2006년 3월 9일). “Carter hails UW's shy hero Foege. New building named for health leader is dedicated”. 《Seattle Post-Intelligencer》. 2009년 9월 26일에 확인함. 이 문서는 2018년 11월 21일 (수) 01:11에 마지막으로 편집되었습니다.